Elevated design, stitched for performance. With a range of full-body harnesses, 3M™ Protecta® Brand has the features and fit for you. You’ll find comfort features that include shoulder pads, moisture-wicking back pads, and foam hip pads with mesh for extra breathability. Work ease features such as an easy-link SRL adapter for the fast, simple attachment of SRLs, and a sturdy belt for convenient tool-bag carrying. And, of course, important safety features including impact indicators, protected labels, and auto-resetting lanyard keepers. Unique design keeps the user's hand out of the way -- no more busting your knuckles! The Comfort Grip snap hook is ideal for those requiring direct connection to the anchorage structure such as scaffolding and towers. The 2-1/4" (57mm) gate opening is transverse load rated and allows safe tie off in multiple orientations to various structures directly. The unique design keeps the user's hand out of the way - no more busting your knuckles. We now offer the Comfort Grip snap hook on several of our Nano-Lok™ self-retracting lifelines as well as EZ-Stop™ shock absorbing lanyards. A lightweight, tangle minimizing retractor for tools up to 5 lbs. Help keep tools up to 5 lbs. securely tethered the simple way. The 3M™ DBI-SALA® 5 lb. Tool Retractor features a lightweight, compact housing and a strong Dyneema® retracting line. This design helps reduce line twisting —minimizing tangling and tripping hazards —while reducing weight on workers’ belts and harnesses. Hands-free mobility and protection for rail workers. Unique anchor slides across the rail following you work for complete freedom of movement and fall protection. A compact design makes attaching the anchor to the rail simple, fast and safe. Stainless steel construction provides maximum durability and the high visibility labeling helps others see you. Ideal for use with our Force2™ shock absorbing lanyards, designed for foot level tie-off applications. Compact and lightweight anchor provides quick overhead tie-off point. Unique Drop-Thru Anchor is fast and safe, providing a 5,000 lb. overhead tie-off point. Simply drop the swiveling D-ring through a 1-1/2” to 1-3/4” dia. hole in concrete or steel meeting requirements in our user instructions and you’re ready to go. The anchor can be removed and simply re-installed in a new location for added jobsite flexibility and lower overall cost of ownership. 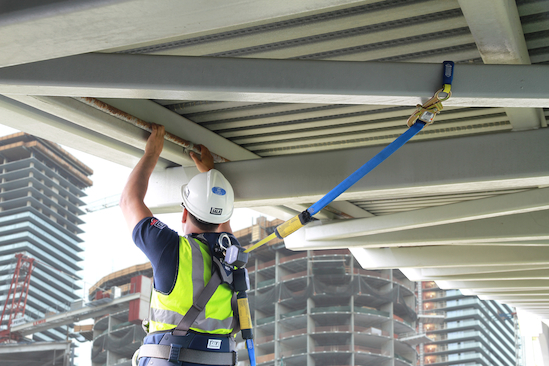 Hands-free mobility and protection for workers climbing vertical structures. The Lad-Saf X3 3/8" (9.5mm) Detachable Cable Sleeve is a portable connection device that connects the worker's harness to the ladder cable and glides freely up and down the cable as the worker climbs. Once attached, the sleeve does not require any further handling by the climber and allows the climber to move up and down the entire length of the ladder safety system with ease and confidence. Whether you need a broken strobe replaced atop a jumbo jetliner, or it’s simply time for routine maintenance, your workers should only have to focus on one thing: getting the job done right. The Mobi-Lok™ Self-Contained Vacuum Anchor (SCVA) system allows your workers to conveniently anchor to virtually any smooth, non-porous surface—enabling them to work where they need to without compromising their fall protection safety.